It all began when I set out on an outrageous quest to buy a new pair of trainers. The ones I was currently wearing looked fine, but the sole was thin and I was getting blisters. While Sapporo is surrounded by high mountains, the city itself is amazingly flat. This makes it great for walking, causing me to neglect all forms of public transport and hop around the city like a teenager without a driving license. The upshot of this was that I had found the location of 101 backstreet Raman bars and had craters in my feet that looked like there were rodent-sized bed bugs hiding in my futon. I was reasonably sure it was the shoes. The pair I wanted were in a deep rust-colour and looked more like a fashion shoe than sports equipment. 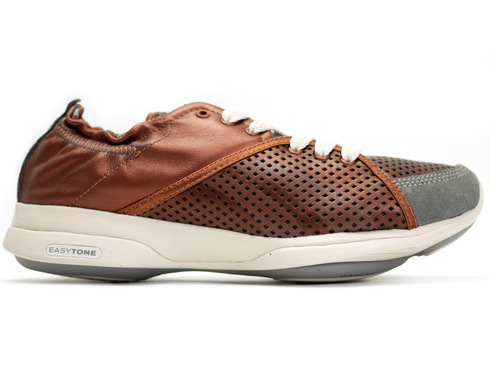 Despite this, they had a proper sole that was used throughout the brand's entire "easytone" range that included designs for serious gym workouts. This --I decided-- should allow me dress as if I were going to check out a few shops, but still provide enough suspension for a 10 mile run around the town. No one would suspect my crazy ways, oh no! At least, not until I hurtle into them. The first shop I tried was in the indoor mall on the east side of town. They had the shoes in stock, but the largest size was a UK 5.5 (about a US women's 8). I normally take a UK 6, but I gave the 5.5 a try. Two minutes inside that shoe confirmed that I would have to lose at least three toes for a proper fit and somehow I didn't think that would help my walking problems. Peeved, but undefeated, I set off to the centre of town to try another few stores. ... only to find exactly the same problem. I have never considered my feet large. In fact, I always thought I was a little smaller than average. It turns out this was a mistake. I clearly have the foot size of an obese yeti. "Maximum size." One of the shop attendants finally broke it to me, tapping the squiffy 5.5 box with a finger. He held out a different trainer in the 'easytone' men's range. "We have these in a 6." To be fair, these other shoes were pretty nice. They just weren't the cute, golden brown chestnut delights I had completely set my heart on. The sort of shoes that I had determined it would be impossible to look bad in due to their radiative glow of adorable magnificence. .... When you're coming from such an angle, it is hard to consider a different design. A look around the shop did inform me that I was just unlucky with that particular brand. Other shoes for woman went up to at least a UK 6 or 7. Apparently, the 'easytone' shoes were very much focussed on the petit Japanese woman. As I left, I went back and glanced at the box of the shoes I was forbidden to wear. Made only for Japanese women. ONE DAY when I'm vastly famous and the crowds are screaming Harry Potter sums of money for my autobiography, I can just hit "print" on my blog and buy a castle in Scotland.